who thundered awesome wonders which were revealed from on high. Let us worthily venerate the defenders of the Trinity. They are the three apostles added to the Twelve. They are rivers which overflowed living waters out of Eden. They nourished the face of the earth with life-giving divine waters . fashioning not creation but the true faith. have spread through all the earth and sea. and preserved in the one true faith. loudly sing and praise these instruments of the Holy Spirit. They are the true trumpets and orators of the Word. and forgiveness to all of us. distinct ion body but joined together in the Spirit? the luminaries who enlighten the world, and pillars of the Church. Christ our God mercifully gave them crowns of glory. With what songs of joy shall we crown the God-bearing mystics and preachers? the sublime theologian Gregory, and John the Golden-mouthed. the Lord who grants his great mercy. With what praiseworthy words shall we honour the holy bishops? They were comparable to the apostles in rank and gifts through grace. They defeated heresy and were sanctifiers by word and deed. They were Christ-like shepherds in the faith. They were earthly angels and heavenly men. by Christ who grants His great mercy. shall we crown John the Golden-mouthed, Basil, and Gregory? pillars of the Church, the foundation of the faithful, and comfort of sinners. refreshing our souls with water. They ask forgiveness for our sins and great mercy for us. Who would not bless you, most holy Virgin? For the only-begotten Son, who eternally proceeds from the Father, came forth from you. Gregory, called the Theologian; and John, the Golden-mouthed. They are the abyss of those who searched into the wisdom of the Spirit. and ever-flowing wellsprings of leaping and living water. the stewards of grace and mouth of Christ. by whom they were directly enlightened. They pray unceasingly for our souls. for we have been illumined by them. and they became luminaries for the world. They showed themselves to be living strength for the lowly. In faith they devoutly preached the Father, Son, and Holy Spirit. Rejoice, O three preachers of the Trinity. for You have given three great luminaries to us. of your precious desires for our salvation. it radiates with Your glory and hastens to Your blessed kingdom. and save our souls, O Lord and Lover of Mankind. the teachers and defenders of the faithful. Rejoice, O luminary of the Church and immutable pillar, O wise Basil. Rejoice, O heavenly mind and great hierarch, Gregory the Theologian. Rejoice, O golden-voiced John, splendid preacher of penance. observe your sacred and sublime feast. the only Theotokos and the strength of believers. splendorous luminary and gate of heaven. who contained God with your womb. Rejoice, for without exception you are higher than all the heavenly powers. and who bow down to your holy and pure birth-giving. and the truly golden-mouthed John. Their teachings pout out a stream of gold for us. Precious in the sight of the Lord is he death of His faithful. 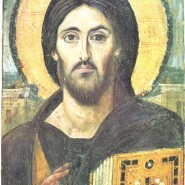 implore Christ our God to save those who honour you. Today the souls of mortals are elevated above earthly things. Today they become heavenly beings as the commemorate the saints. and the ways of the Lord are made known to us. and proclaim the words of the Word. because through them there has been peace for the faithful. Today, Christ is being carried into the temple as an infant. Today, He who gave the Law to Moses comes under the Law. being held in the arms of an aged man. for I have seen You and I now rejoice. Rejoice, Virgin Mary, Mother of God, full of grace,* The Lord is with you. * Blessed are you among women, and blessed is the fruit of your womb. * For you have borne Christ,* the Saviour and Deliverer of our souls. In Tone 5: Let us all praise Basil, the royal adornment of the church,* the inexhaustible treasury of teaching,* for he has taught us to worship the holy Trinity,* which is united in essence but separate in Persons! Divinely-wise fathers, shining lamps of the Church of Christ,* you have enlightened the world with your teachings,* withering the errors of heresy and quenching the fire of blasphemy! * As Christ’s holy bishops, pray that we may be saved! Most-hymned Virgin, Mother of Christ God,* Mary, unwedded Bride of God,* intercession for the faithful, Lady Theotokos,* deliver from all misfortune and need* those who run to your protection with faith and love,* for you alone are the Bride of God! In Tone 3: Gregory the theologian, you were a pillar of the Church. * You were shown to be a treasury of devotion which cannot be taken away! * You enlightened your life with dispassion,* making plain the teachings of the Trinity. * Venerable father, entreat Christ God for the salvation of our souls! Like bees hovering over the meadow of the Scriptures,* you embraced the wonderful pollen of their flowers. * Together you have produced for all the faithful* the honey of your teachings for their complete delight. * Therefore as we each enjoy this, we cry out with gladness:* blessed ones, even after death,* be advocates for us who praise you! Storm-tossed by the triple waves of the passions,* although I am without a conscience, I fervently call on you:* do not turn from me, all pure One, lest I perish in my wretchedness! * You gave birth to the depth of mercy and I have no other hope than you! * Do not let my enemies rejoice over me or use me as a byword,* for I have put my trust in you. * You can do whatever you desire for you are Mother of the God of all! We extol you,* O Holy Hierarchs: Basil the Great, Gregory the Theologian, and John Chrysostom* and we honour your holy memory,* for you pray to Christ our God for us! verse: My lips will speak words of wisdom! verse: Understanding will be my heart’s desire! Your priests shall be clothed with righteousness* and Your saints shall rejoice! verse: My lips will speak words of wisdom, understanding will be my heart’s desire! Through the prayers of the holy Hierarchs,* O merciful Lord,* cleanse me from the multitude of my transgressions. Grace was poured forth from your mouths, venerable fathers,* and you became pastors of the Church of Christ,* teaching the reason-endowed sheep to believe in the consubstantial Trinity* in one Divinity! Irmos Come, people, let us sing a song to Christ our God, who divided the sea and guided the people He had led from Egypt, for He has been glorified! 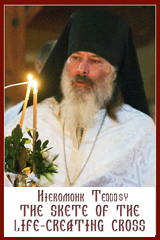 Refrain: Holy Hierarchs, pray to God for us! People, what thanksgiving, what fitting response, should we offer to our benefactors? For they taught us how to live in goodness! Let the tongues of the orators, their skill and craft and all the power of their words, now be focussed on this one intention! Let us honour them, and venerate them all together! With their minds in heaven, they allowed nothing to be held as their own on earth. They were shown to be guardians and patrons of the community. Therefore let them be considered worthy of our common hymns of praise! With one mouth and one accord, we all glorify you, most immaculate One, as the object of our nature’s common honour. Katavasia The sun’s rays once shone on dry land in the midst of the deep, for the water on both sides became firm as a wall while the people crossed over the sea on foot offering this song acceptable to God: let us sing to the Lord, for He has been greatly glorified! Irmos Lord, establish us in You, for You have killed sin by the tree! Plant the fear of You in our hearts as we sing hymns to You! The great trumpet of the churches, the lamp illuminating the inhabited earth, the preacher embracing the ends of the earth with his voice: the great Basil summons this assembly! Brilliant in his life and actions, brilliant in sermons and teaching, shining more than all, as another sun outshining the stars, the greatly honoured theologian is called blessed today! Behold, the light of the world is manifested to the world! Behold, the salt of the earth seasons the earth! Behold, the tree of life, the golden saint, yields immortal fruit! Let those who wish to escape death come and feast sumptuously! He who brought all things into being from non-existence and granted nature to every creature, knew Himself how to transform the given natures as He desired. Therefore the Virgin gives birth and who would not be amazed? Katavasia Lord, the firm foundation of those who put their trust in You, strengthen the Church which you have purchased with Your precious Blood! (Tone 8) Let us, as we enjoy the beauty and grace of their words,* with one voice praise the great and shining lights, the indestructible pillars of the Church:* the wise John of golden speech, the great Basil, with Gregory the renowned theologian. * Let us cry out to them, exclaiming from the depths of our hearts:* three times great and holy hierarchs, pray to Christ our God,* that He may grant remission of sins to those who celebrate your memory with love! You received the wisdom that comes from God, three new apostles of Christ! * By understanding sermons, in simple words through the power of the Spirit,* you framed dogmas set down earlier by the fishermen. * Indeed our faith feeds on the plain nourishment received from you. * Therefore we all cry out: pray to Christ our God,* that He may grant remission of sins to those who celebrate your memory with love! Virgin, draw near my lowly soul that is being drowned! * It is without a pilot in the storm of the temptations of life. * It is sinking with sin and in danger of going to the bottom of hell. * Grant it peace and rescue it from perils, Theotokos,* for you are a calm harbour that knows no waves! * Intercede with your Son and God that He may give me remission of sins* for I am your unworthy servant and have you as my hope! Irmos I have heard the report of Your dispensation, Lord and have glorified You, the only Lover of mankind! You acquired the knowledge of lower wisdom, all-glorious ones. Through the wisdom of God, you received a guiding position; therefore you wisely made the lower wisdom serve you as a handmaid. Lovers of wisdom, since you loved knowledge, you all learned to speak wise words. You were filled with wonder! You taught the discipline of action and then contemplation. In the last times, the source of everlasting waters, the Creator came down as a light rain, all-blameless One, like drops into your womb, seasonably refreshing those who were fainting. Katavasia Your virtue, O Christ, has covered the heavens, for proceeding from Your undefiled Mother, the Ark of Your sanctification, You have appeared in the temple of Your glory as an infant in arms, and the whole world has been filled with Your praise! Irmos Lord, the Giver of Light and Creator of the ages, guide us in the light of Your commandments, for we know no other God but You! You permitted the saints to drink deeply from the well-spring of Your gifts which is not diminished in any way by this emptying, but waters the whole earth with the divine streams which flow from them, O Lover of mankind! What is gold to me? What are riches, glory and power? Let all things vanish like smoke before the wind! For me the only great wealth is the Trinity of eloquent preachers! The river flows with ambrosia and nectar: it is a torrent of the food of immortality for those who hunger and incorruptible drink for those who thirst! Its water is eternally living and sustains the living who drink of it. All of you, partake of its everflowing life! Evil has power against us, but not at the end, for it became weak after the Virgin gave birth to the One who is powerful in strength, who took upon Himself the weakness of the flesh and killed the one powerful in evil. Katavasia In figure, Isaiah saw God on a throne, lifted high up and borne in triumph by angels in glory, and he cried: Woe is me, for I have seen beforehand God incarnate; Lord of the light that knows no evening and king of peace! Irmos Tossed about in the deep abyss of sin, I call upon the unfathomable abyss of Your loving-kindness: lead me up from corruption, O God! Together you three bless the properties of God: the unbegotten nature of the Father, the generation of the Word and the procession of the Spirit Himself. Today salvation has openly and radiantly come to this house, for Christ, in honour of His own name, is present in the midst of the two or three gathered together. The depth of the earth is immeasurably distant from the heights of heaven, yet divine desire has caught up the saints from the earth higher than the heavens. The three divine preachers have you, O Virgin, as a new well-spring and fountain of mysteries. They adopt a new way of speaking from new sources. Katavasia The eyes of the elder saw the salvation that was come to the gentiles and he cried aloud to you: O Christ, coming from God, You are my God! (Tone 2) You received Your inspired and steadfast preachers, Your chief teachers* into the enjoyment of Your good things and into repose. * You who alone glorify Your saints,* accepted their labours and death* more gladly than any holocaust. Who can open his lips and move his tongue about those who breathed fire in the power of the Word and the Spirit? Yet I shall be bold to speak a word about what is so great. For these three have transcended all human nature in their many and great gifts, surpassing those who are illustrious in both action and vision. Therefore you counted them worthy of great gifts, for they are Your faithful servants and You alone are glorified in Your saints! Irmos When the golden image was worshipped on the plain of Deira, Your three youths despised the godless command. Cast into the midst of the fire, they were bedewed and sang: blessed are You, the God of our fathers! The former erratic insolence of heresies is vanquished and in retreat and every degraded teaching appears like wax melting in the fire, struck down by your fiery proclamation, O blessed ones. These three avoided the false myths of pagan Greeks and chose persuasion alone to establish their authority among people. Thus they established the truth, moving all the congregations of the faithful and persuading them. Every prophecy is fulfilled and comes to rest in you, amazing those who cry out: O pure One, miracles come from you more radiant than the prophesies, clearly showing the interpreters to be most wise! Katavasia In the midst of the fire, O Word of God, You dropped dew on the children as they spoke of things divine, and You took up Your dwelling in the pure Virgin! We praise You as we sing with piety: blessed are You, O God of our fathers! Irmos Let us sing hymns to God who descended into the fiery furnace and changed the flames into dew for the Hebrew children: praise the Lord, all works of the Lord and exalt Him above all forever! We perceive and glorify with equal reverence one nature, the powerful Unity and Trinity who orders all by higher words. For so the three God-bearers taught us to worship. Together with them we bow down before the Trinity forever! The three divine preachers were united in conceiving of the Trinity as a Unity. In all things they safeguarded the indivisibility of the divine nature from which they received a share of the one undivided glory which gathers all together for a common celebration exalting the Trinity above all forever! When the Benefactor had received what is ours and had given in return that which is His own, He created but did not suffer, Virgin, for He deified our nature but was not made corruption. He suffered of His own will to set mankind free from the passions through His sufferings as the three fathers mystically teach us. Katavasia Standing together in the unbearable fire, yet not harmed by it, the children champions of godliness, sang a divine hymn: all works of the Lord, bless the Lord, and exalt Him above all forever! Irmos The Son of the Father without beginning has appeared to us: God the Lord, made flesh of the Virgin, to give light to those in darkness and to gather the dispersed. Therefore we magnify the Theotokos. Magnify, my soul, the three great luminaries among the priests! Behold, your field; the flock for which you undertook the greatest labours! We have assembled to bring you three together. Your good union is our common claim. Grace did not wield a doubled-edged sword against her enemies, but a three-edged dagger: the slashing mouths of the three orators! The were one sword forged in heaven, with three tempered blades of tongues ever fighting in defence of the one thrice-radiant Divinity. Your citizenship was in the heavens with those clothed in undefiled flesh, glorious ones. Now you dwell with them exclusively, interceding for us who still wear earthly wreaths, that we may remember and work towards higher things. The breadth of your great works restricts me, Lady, overwhelming the prudence of my speech. I am at a glorious loss, lacking an answer to my hesitation! So let us glorify Him who has so greatly magnified you! Katavasia We faithful saw the figure in the shadow of the Law and the Scriptures: every male child that opened the womb was holy to God. We also magnify the first-begotten Son of the unoriginate Father, the first-born Son of the unwedded Mother! Let us praise the God-bearing fathers,* the three radiant lamps shining more brightly than the sun with the light of the Trinity,* the Author of light, the three-sunned Unity,* supernaturally united! Let us all now praise the vessels of light, the lighting bolts of fire:* Basil the Great, Gregory the Theologian and John Chrysostom! One God: Father, Son and Spirit,* through the prayers of Basil, Gregory and John and of the all-pure Theotokos,* let me not be cut off from Your glory! strength of the faithful, downfall of the heretics! and fed them with many virtues. You were openly preachers of grace, setting forth laws for the fullness of Christ’s Church! pray to Christ that He may grant our souls great mercy! watering the face of the earth with your teachings, ladders of theology! nourishing with the milk of salvation! Adornments of wisdom, pray to Christ that He may grant our souls great mercy! Let us sound the trumpet of hymns! Let us dance to the music of the feast! Let us leap with joy in the festival of our teachers! pastors and teachers, the three initiates of the sacred mysteries of the holy Trinity! those at sea, because they are their guides. and by your prayers deliver them from eternal torments! to crown with blessings those who honour her with hymns! Let kings and princes assemble! who was pleased in His love for mankind to loose those held by death. the golden jar of manna, the closed gate of the Word, the refuge of all Christians! for through your prayers all things are possible! Troparion, Tone 4: As equals to the apostles in the way you lived* and teachers of the whole world,* intercede with the Master of all* to grant peace to the world,* and to our souls great mercy. Kontakion, Tone 2: You received Your inspired and steadfast preachers, Your chief teachers* into the enjoyment of Your good things and into repose. * You who alone glorify Your saints,* accepted their labours and death* more gladly than any holocaust. Святих трьох святителів, великих архиєреїв – Василія Великого, Григорія Богослова й Івана Золотоустого; I святого священномученика Іполита – 30 січень. Тропар (глас 4): До апостолів подібні* і вселенної вчителі,* Владику всіх моліте,* щоб мир вселенній дарував* і душам нашим велику милість. Кондак (глас 2): Священних і боговісних проповідників, найвищих учителів,* Господи, прийняв ти в насолоду дібр твоїх і упокій,* труди бо їх і смерть прийняв ти вище всяких плодів,* єдиний, що прославляєш святих твоїх. На всю землю вийшло вістування їх* і до кінців вселенної глаголи їх (Пс 18,5). Стих: Небеса оповідають славу Божу, і діло рук Його проголошує твердь небесна. (Пс 18,1). Браття і Сестри, пам’ятайте про наставників ваших, які звіщали вам слово Боже, і дивлячись уважно на кінець їхнього життя, наслідуйте їхню віру. Ісус Христос учора й сьогодні – той самий навіки. Не піддавайтеся різним та чужим наукам: воно бо добре укріпити серце благодаттю, не стравами, які не принесли ніякої користи тим, що віддавалися їм. Є у нас жертовник, з якого не мають права їсти ті, що при наметі служать. Бо котрих звірят кров архиєрей заносить у святиню за гріхи, тих м’ясо палиться за табором. Тому й Ісус, щоб освятити народ власною своєю кров’ю, страждав поза містом. Тож виходьмо до нього за табір, несучи наругу його, бо ми не маємо тут постійного міста, а майбутнього шукаєм. Через нього принесім завжди Богові жертву хвали, тобто плід уст, які визнають його ім’я. Добродійства та взаємної допомоги не забувайте: такі бо жертви Богові приємні. Стих: Ісповідять небеса чуда твої, Господи, і істину твою в церкві святих (Пс 88,6). Стих: Бог прославлюваний на раді святих. (Пс 88,8). Радуйтеся, праведні, у Господі, правим належить похвала (Пс 32,1). Алилуя (х3).